I was in a liquor shop in the middle of nowhere (desert) with other travellers and I was just starring at the world map taking up the entire wall of the far side of the counter and it’s colourful. Not just because it was kind of graffitied it with Arabic writing (I think) and named the countries I can’t read, but because the map itself is…colourful and ..interesting. I starred at the world map and it’s multicoloured, China for example is green. I am not sure why China is green, perhaps it is just a random printing. Well, at least the sea is Blue. I do not have a world map framed on the wall in my room. I do remember I have a Atlas from Geography at school. To travel alone, I bought a little world map book 10 years ago. Whenever I travelled, I brought it with me to make instant travel plans while on the roads……Do you have a world map mounted or framed on the wall in your room? Leaving Marrakesh travel towards Ouarzazate through the Atlas Mountains, I was able to enjoy an ample variety of beautiful landscapes and many authentic Berber villages through the window, and after 4 hours drive the first big stop of the Sahara desert camp was in ‘Ait Benhaddou Kasbah’ a 16th century well known fortified village in the Province of Ouarzazate. 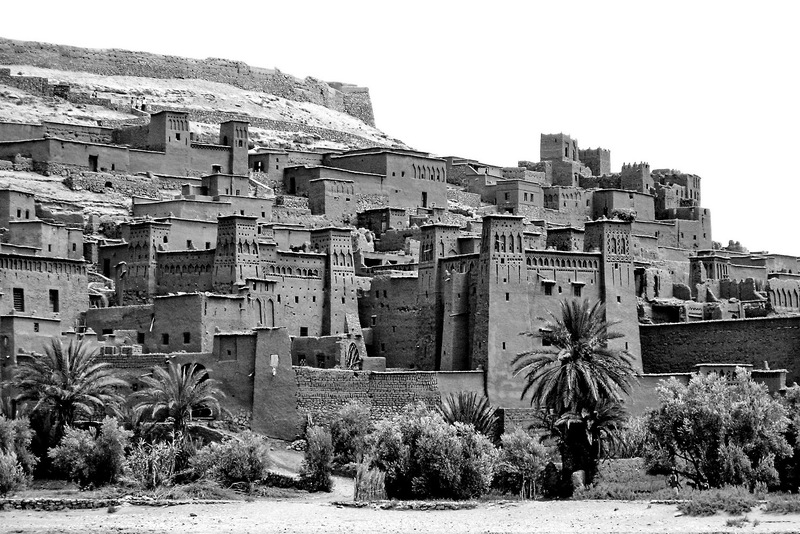 It is a UNESCO world heritage site, a striking example of southern Moroccan architecture. Many big movies have been shot here, The Mummy, Gladiator, Prince of Persia etc. The town itself is the main attraction, with earth and clay brick buildings climbing up the hill. Admiring a decoration here and a view there, you can really feel like you have travelled to the past.